Eun Dae Gu (Lee Seung Ki), Uh Soo Sun (Go Ah Ra), Park Tae Il (Ahn Jae Hyun) and Ji Gook (Park Jung Min), are the new recruits at Gangnam Plice Station, otherwise known as the P4. Only trained detectives get to work at the speciel violent crime unit at the station, but because of a new proposal, they want to train new rookies. These four rookies were chosen, despite their lack of enthusiast nor passionate of their job, they all joined the crime squad of various reasons. Eun Dae Gus one and solely reason to join the police force was to revenge his mother whom was killed right in front of his eyes. 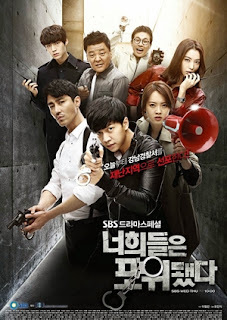 The target is the teams leader, the erratic and hot headed Seo Pan Suk (Cha Seung Won), who wants nothing more than to wash his hands off of the incompetent new recruits. I’m so glad I finally watched this drama, it’s been on my To-Watch list since it came out, and it bugged me so much that I still haven’t watched it. You know, those kind of dramas when you missed the WATCH sign, they go back to your list and stay there foreeeever. So recently I saw a drama MV about it, and it was really cute and I already had it on my pc, so I just started it right away. Two days after I was done! It felt like a stone fell from my heart, although I definitely enjoyed the drama, but just the fact that I’m done with it was more overwhelming. Well, now to the drama itself, it was very entertaining, and the rookie foursome was so lovable and great together that I feel like the show sort of locked into that group chemistry. Ahn Jae-hyun had a great rapport with Park Jung-min and they had the most endearing bromance of the show. I love the kinds of roles Go Ara is taking on now, and she’s proving herself to be lively at comedy and drama alike. Although her character Soo-sun didn’t get as much development as Dae-gu did, but their relationship was so sweetly giving and supportive. I loved that their relationship grew very naturally out of being partners, and that they were always equals who respected each other. Cha Seung-won and Lee Seung-gi had such great chemistry with each other and with the cast, that they made me keep watching despite a very obvious plot. Cha Seung-won is truly gifted at turning on a dime from comedy to heartfelt drama, and there’s so much emotion he plays in silent looks that goes beyond what’s written on the page. I don’t know how he does it, but he says nothing, and I can read regret and sorrow and longing and gratitude and pride in his eyes. All in all a drama that should be watched because of the actors, not the plot. Like Kamji this drama was sitting on my computer for a very long time, after I had watched episode 1, and I had noticed that this drama was way too typical. After finally finishing it, it really is one of those typically long and quite dragged dramas, in which you do follow and understand most of it, but when thinking back you really don’t remember all the twist and turns. And the fact that there are about 2 lead stories following one another makes it complicated, but also the several sub stories that come along too. The actors are quite good, even the newbie actors, but I have to be honest they were a bit lacking, though that might be because I was completely infatuated by Seung Wons acting, so the bar was kind of high. The screen play was kind of dragged as said before, but a bit unnaturally since there were so many twists, and also the entire feud with the prosecutors made the story slow down to the point where I just felt I should stop right there. On the other hand everything else was okay, it was really an enjoyable story. So do I recommend it? Yes, I do as it is a pretty nice police drama, even though it isn’t an OCN drama.